Following a disastrous attempt by a previous contractor to repair a short (30m) length of eroding bank through a private garden using imported concrete rubble and bricks placed into the channel. Not only did this create an ugly eyesore in the private garden it also led to even more instability along the bank. 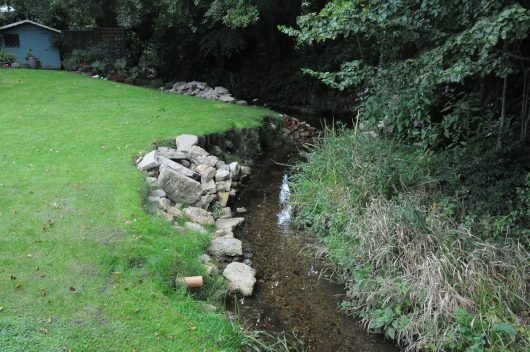 The landowner, who was pretty fed up at this point, called the CBE team to ask if we would be able to carry out the necessary remedial work to reinstate the channel bank and also to improve the overall aesthetics of the stream, which ran through their back garden. Following an initial site inspection, we were able to quickly assess the problem and develop a solution to stabilise the 30m length of eroding channel bank. At all stages of the project the client was kept fully informed of project developments and any wishes they had (such as for a reinstated lawn on completion) were incorporated into the final design. We removed all the existing rubble placed in the stream by the previous contractor and carried out the repair works utilising the ‘coirnet’ revetment system to reinstate the bank. The works undertaken reinstated the eroded bank margin as well as providing a long-term aesthetically pleasing solution suitable for the location within a small private garden.